Happy Sunday. How are you guys?I hope you guys doing fine. Again, I'm sorry from my deepest of my heart for missing from my blog. I have a hectic schedule because I still working as full time, when I come back home, I feel tired and constantly fall asleep.That's the art of getting "old"..haha.But, I'm trying my best to keep up with everything here and give my best to inspire you guys.If you realized, I added few new categories so a lot will happen soon. 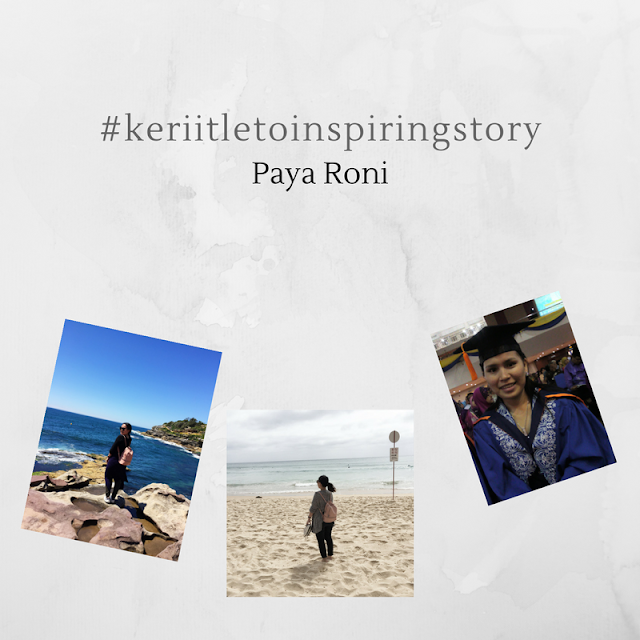 For today, I want to share about #keriitletoinspiringstory, one of the new category in my blog. My aim for this is I want to inspire every #keriitleto out there to do what they love, to live the life that they ever wanted and most of all, dare to dream big! I feel a little bit embarrassed to share my own story for the first one but I think it's great, right? Without further due, let's check my story out. I know some of you heard of my story before if you ever read my previous post and most of you doesn't even know me so obviously, you may do not know about me.So, I will briefly share about myself. My name is Paya Roni. Yes, that's my real name. I'm Kenyah Badeng girl from Kg.Data Kakus,Tatau,Bintulu.Currently, I'm working full time as Design Engineer in Malaya.So, that's it! Super short and I hope that's help! I was born in Sarawak in Kenyah Badeng family. We lived in rural area in Sarawak and I been lived my life in Sarawak since I was born. I got my early education, my high school in Sarawak, no other places I rather be ( no choice after all). The first time I come out from my Sarawak was when I continued my study to Labuan Matriculation College/Kolej Matrikulasi Labuan after my SPM. It's first time of everything. Start from ride the flight, keep money on my own, go somewhere far without my parent. It's such a quite scary journey I guess, oh ya.. I'm 18 years old that time.When I think back about this journey, I secretly feel proud of my 18 years old(hehe..).Since everything is first time, I "jakun" with everything but thanks God, I am a fast learner and easy to blend in the situation.I got new friends ( Yuny,Pija,Phyea are my roommates) and I met a lot of different type of people too. I learned from my situation that time. I growing up as a teenager in my school or boarding school. Most of my teenager time, I spent away from my family, spent time in school and friends.But, that's for the sake of education.I finished my college with not so excellent result..haha, I'm just fall in love with Korean dramas this time..hhahaha, I know guys you too also right? - Don't forget you first aim to be here (Study and aim for excellent result). - You can try everything but you know which one will ruin you for a very long time. - Learn to survive in the adult's world is hard but you must learn. Then, the next stage of my life is begin. It's university life or famously known as Uni Life.Amazing experience! I'm blessed and thankful I got offer in Engineering course in Universiti Malaysia Perlis, it's Malaysia Northern ( near the Southern Thailand). It's my first time come to Malaya. It's 2007...hahaha, it's a brand new world for me. I don't have time to feel homesick as I was amazed with what my eyes just sees.I never dreamed to come to Malaya to further my study.I know it will be hard for my family to support me.Again, thanks God for make something impossible become possible.Along the way from Bintulu airport to KLIA, I can't stop praying as I went by myself. My parent cannot afford to come with me.But, they trust God will be always be there with me and I believe in that too. I just went to Malaya with my faithful heart.The first year of my study was all about hard work, study hard and I remember my reason came here. I want to change my family life.Then, second years and years after that, I'm a little bit forgetful..haha, I'm being really honest with you guys now. I see and experience different kind of world. I'm fall in love! It's my first love! hahahhaa.. But, even though I'm madly in love that time, I'm trying my very best to study and get a good result. After all, I graduated but not with my first aim when my first time come to here. - Love yourself first before trying to love others. - Love is sweet but your parent's love is sweeter, remember that! - Never leave God even you madly in love. - Always do your best. - Make new friends and choose a good friend. - Always invest on growing your characters and attitude. Then, the very interesting stage of life is here, it's working life. I called it interesting because it's a lot of thing happen that I can't even remember. It's sweet and sour.This time, I have experienced how to work with people, how to upgrade yourself every time, get to know myself very well, I'm heartbroken, i'm trying to get up and make it. Every day I'm trying my best to make my dream come true. Despite all that, I have found God. I'm busy searching for life but I never thought I will found my truly God in my busiest time of my life.It's started when the time I feel so heartbroken, I look down on myself constantly and I feel rejected and not worth it. My family and friends did help me during this time but I know, nobody can help me to be a better version of myself than myself or me or I. Then, I encounter my truly God.God is the one that heal my heartbroken feeling and give me strength every day to face this rough life. - You the one that responsible for your life. -Don't look down on yourself. - Seek help when you need help, it's okay. - Let's go what God say No in your life. - Be strong and better for yourself and your family, not for anybody else. - You can dream big no matter where you come from. - God can give you beyond your imagination when you trust,loyal and love Him with all of your heart. - God is my best friend, my father, my sister, my mum and someone that closest to me. Sometime I forget this too you know. - Adults life is hard but there's positive side of that hard life.Always looking to the bright side. - Money is not everything. You're just manager of your money and God is the owner. - Call your family members. - Care about other people too. - Enjoy the time with friends because we doesn't know when we will separate or move away from each other. - Love hard but love God the hardest! - Remember, your parent grow older too as you grow old. When you have time, go visit them, money can be earned but the time with them never come back. - Travel as far as you can. Be brave and challenge yourself. - When the situation is hard, pray harder. I told you this stage of life is really interesting. I learned a lot and I'm still in progress to be a better version of myself from yesterday, be grateful with what I have, trying my best to give my family a good life than before, love hard and love God even harder. I hope this story inspired you in your life.I will update this story when there's another stage of my life(soon)..hehe. I'm thankful for people and family that come together during all stages of my life. I keep reminded myself, my possessions is not last forever but two thing that lasts forever, word of God and people.I'm a normal human too, sometime I feel negative about my life, I feeling down on myself but what's important is how you get up from that situation.You need to be strong, not for someone but for yourself because God doesn't create you to be weak but you're stronger. Remember, our God is able.